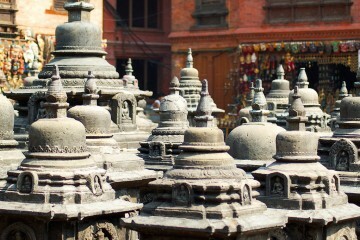 Nepal is one of the most astonishing countries from a religious point of view. It is the land where both Hindus and Buddhists worship and pray in harmony, and sometimes at each others’ temples. You can see a square interspersed with wooden Hindu temples and a few streets away a white Buddhist stupa surrounded by Tibetan prayer flags and wheels. 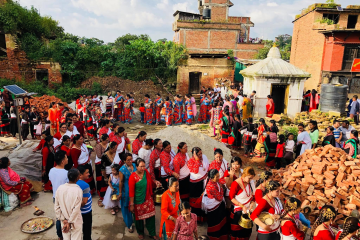 Kathmandu and Patan are incredible places to witness both religions’ practices, but if you really want to experience them at their peak, you should visit the nearby villages of Dakshinkali and Pharping. Pharping and Dakshinkali are very close to each other and it’s convenient to explore them in a day by bus or bicycle. I had planned my one-day trip to Dakshinkali a long time in advance, as I knew that animals are sacrificed there only on Tuesday and Saturday mornings. 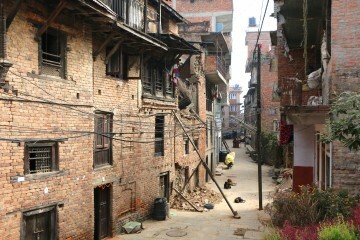 I preferred to travel twenty-five kilometers south of Patan by bus and spend more time wandering around. The temple is dedicated to the goddess Kali, who is seen as an incarnation of Parvati–only more bloodthirsty. 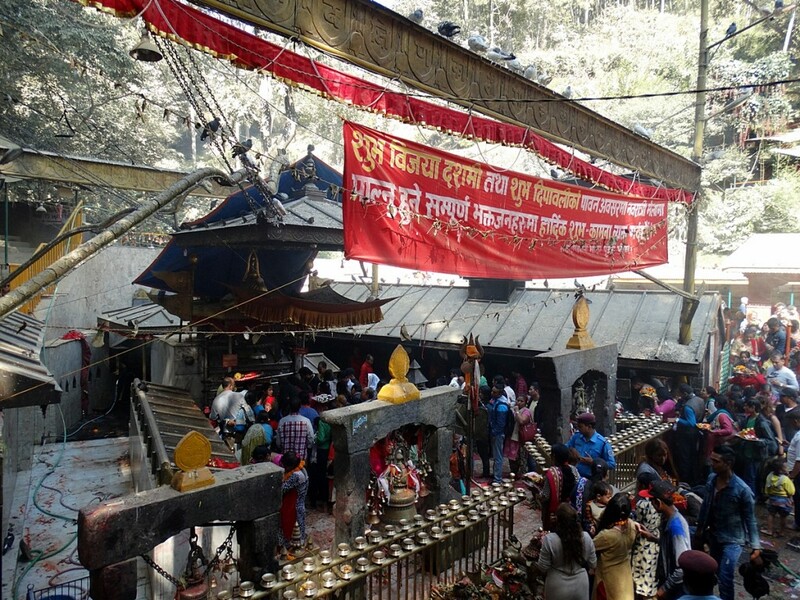 It is a well-known destination for Hindu pilgrims, and some come from afar to sacrifice animals to Kali. 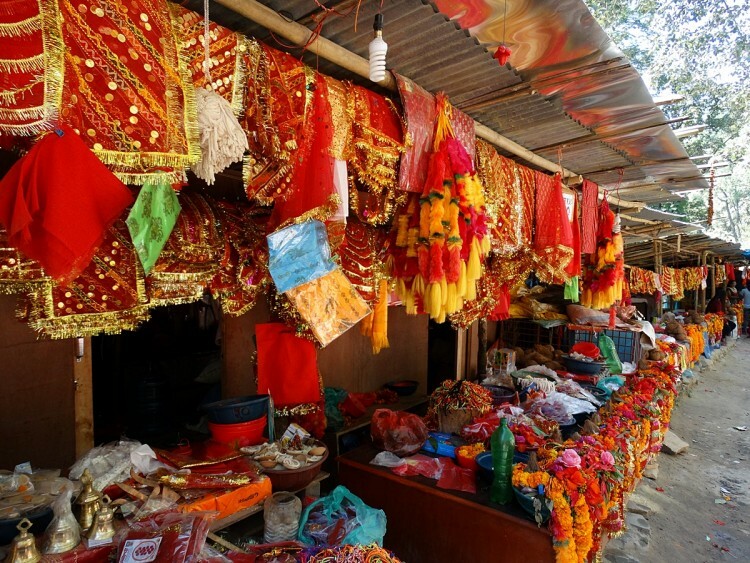 A religious bazaar stretched from the parking place to the temple; pilgrims could buy chickens from stalls to offer as a sacrifice to the goddess. 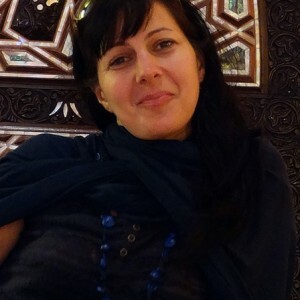 I passed through the bazaar and went down to the temple that was situated in a valley. As I’m not a Hindu I wasn’t allowed to enter the courtyard of the temple, but I could go around it and spot the place where the sacrifices were made, somewhere at the back of the temple. Pilgrims pushed to get more quickly to the temple, a police officer guided the crowds, and orange garlands of marigolds, candles, and bells were laid all over the place. As an add-on, it’s possible to climb a pathway along a row of eateries and reach the small Mata Temple, situated on a hilltop. Although it’s a Hindu temple, non-Hindus can enter if they take off their shoes. Otherwise, you can just admire the surrounding panoramas and eye a footpath that links Dakshinkali to Pharping. Pharping is situated in the nearby area, just a few kilometers away from Dakshinkali. I wanted to avoid taking a bus the short distance, so I walked around until I found a dirt pathway somewhere at a bend of the Pharping Road, not far from the Shree Dakshinkali temple. I consulted my GPS and a man passing by at random. He confirmed the footpath to me, and in less than fifteen minutes of hiking, I was in the middle of the mustard fields that surrounded Pharping village. 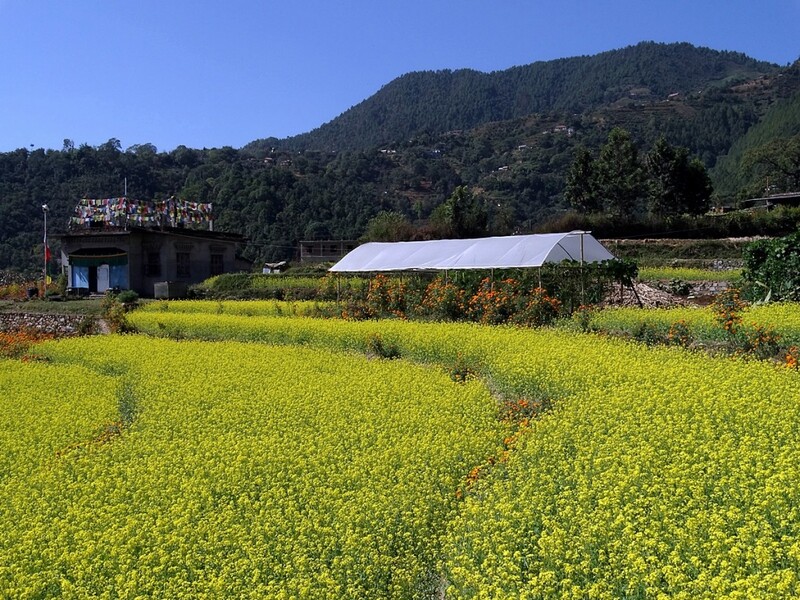 Coming from Dakshinkali, a stunning view of Pharping rises on the horizon, just above the yellow carpet of mustard flowers. As I approached the village, I spotted the top of a white stupa and headed towards it. 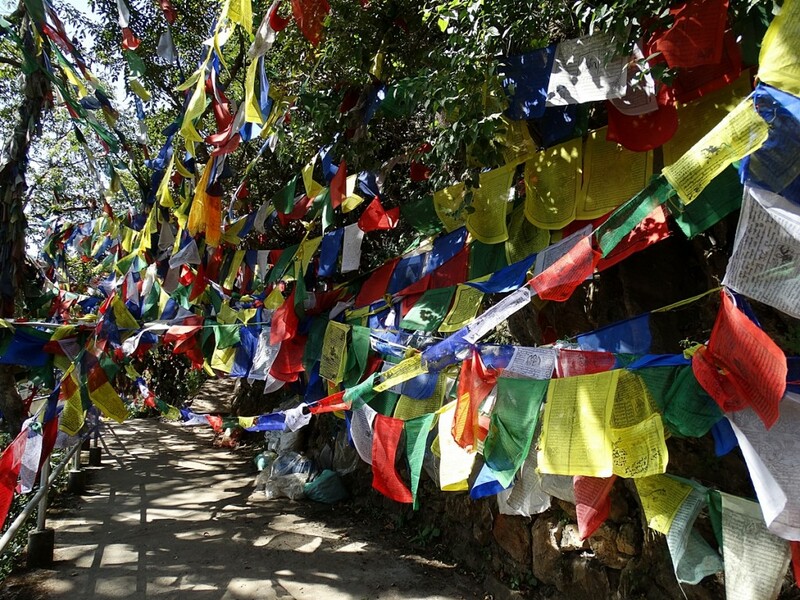 Pharping is an ancient pilgrimage site for Buddhists, and monasteries are spread all over the hills. A pilgrimage route passed among the main sights of Pharping, and it was a good way for me to explore the village and its landmarks. At Rigzin Phodrang Monastery, a Nepali boy convinced me to buy a string of prayer flags, which I hung up at Guru Rinpoche’s cave for good luck. I hiked to another Buddhist monastery, and from there descended some stone steps to the colorful Vajra Yogini Temple. I came back to the main street of the village near the Buddhist monastery Sakya Tharig, where an enormous golden statue of Guru Rinpoche inside a glass box greets pilgrims. My day trip to the villages south of Patan brought me a new understanding of Hindu and Buddhism. Spending a day among these villages might reveal aspects of these religions that you have never thought of before. Wandering around and observing the local traditions are a good way to understand the connection that exists between two of the most important religions of the world. No Kali don’t receive here any blood offering. They are destined to the Nava Durga in the lef part of the courtyard. Before writing, better to study and take time to check informations.